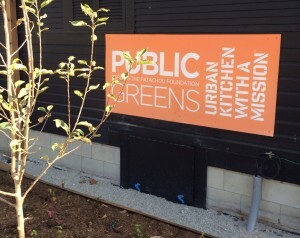 There’s lots happening at 64th and Cornell in Broad Ripple as construction work wraps up on restaurateur Martha Hoover’s newest project, Public Greens. Public Greens, the newest in restaurateur Martha Hoover’s Patachou restaurant group, will open in November. at 64th and Cornell streets in Broad Ripple. The restaurant is located right on the Monon Trail, with an adjacent microfarm operated by Growing Places Indy that will provide fresh produce. All profits from the cafeteria-style restaurant will go to fund Hoover’s Patachou Foundation, which is working to alleviate childhood hunger by providing healthful after-school meals for Indianapolis school children.